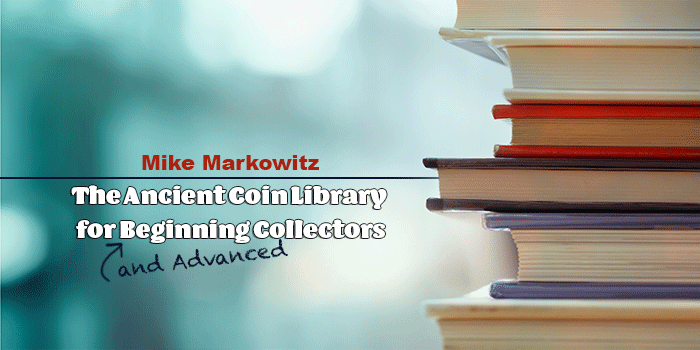 CoinWeek Ancient Coin Series by Mike Markowitz …. For beginning collectors of early and modern American coins, the choice of reference books is simple. If you have The Official Red Book®, you’re probably good to go. With 463 compact pages of comprehensive, reliable information — at a list price of just $17.95, the Red Book is a no-brainer. Collectors of ancient coins face a more daunting task. Ancient coins come in tens of thousands of types, with hundreds of “issuing authorities” (empires, cities, tribes, and rulers) and the books that document all this information represent centuries of accumulated scholarship — not all of it in English. 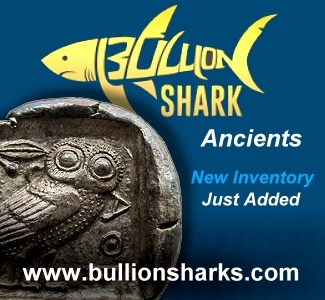 Ancient coin books can be costly, and hard to find. 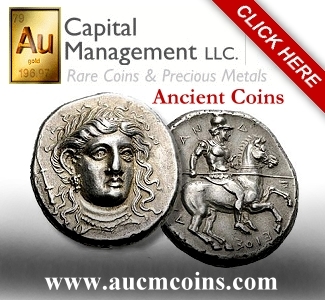 In general terms, ancient coins fall into two broad categories: Roman and “Greek.” For convenience, coins issued by many peoples who spoke Semitic, Celtic, Central Asian and other languages are lumped into the “Greek” category. 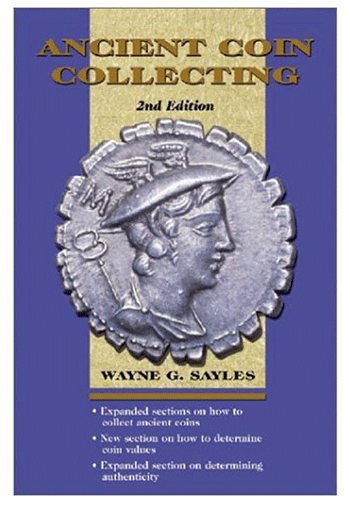 If you’re not quite sure where to start, the best first choice is Ancient Coin Collecting by Wayne Sayles. With a list price of about $22, the second edition delivers 312 pages of solid advice, with over 300 photographs and many charts and tables. 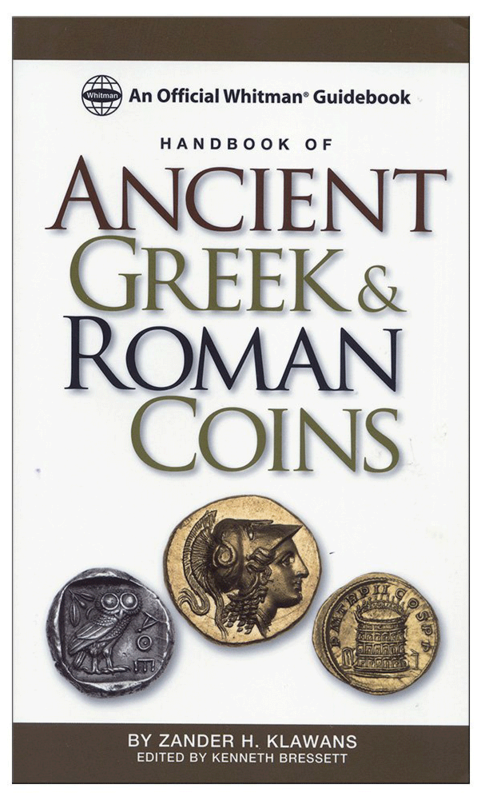 As one reviewer noted, “I wish I had this book twenty years ago when I began collecting.” Other titles by the same author cover Greek, Roman, Byzantine, and other coins, plus Classical Deception, the best non-technical book on counterfeit ancients. If these are the only ancient coin books you ever buy, you will be glad you did. Full Disclosure: founder of the Ancient Coin Collectors Guild, and a tireless champion of the hobby, Wayne Sayles is one of my personal heroes. 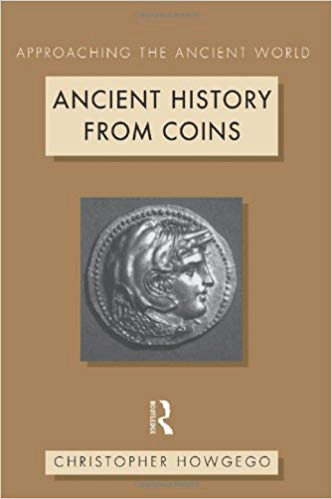 A useful and inexpensive reference, The Handbook of Ancient Greek and Roman Coins, originally written in the 1960’s by Zander Klawans, was revised and updated by Ken Bresset in 1994. Part I, “An Outline of Ancient Greek Coins,” includes a guide to symbols and city names, and a listing of kings, tyrants, and satraps. Part II, “Reading and Dating Roman Imperial Coins,” is an essential guide (unless you plan to collect coins of the Roman Republic). A large-format superbly illustrated “coffee table” book, 100 Greatest Ancient Coins by eminent Chicago dealer Harlan J. Berk is only 131 pages, but it has proven useful to me far beyond its modest price ($24). You may never be able to afford many of these coins – some are extremely rare and sell for hundreds of thousands of dollars when they appear at auction. 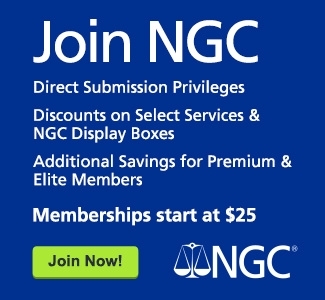 But as a collector, you need to know about them! These 100 coins are the landmarks of classical numismatics, and when you know the landmarks you can navigate with more confidence. The coins are arranged in chronological order, but there is a table lists them in rank order and a “gallery” section that shows all the coins at actual size. Each coin has a short price history, with the kind of market trend information that only an experienced dealer could provide. The book includes a good glossary of technical terms and a bibliography. Classical archaeologists are typically only interested in coins to the extent that they help to date a stratum. Archaeologists learn a lot about pots since pottery is so commonly found in excavations, but much less about coins. Christopher Howgego, curator of Roman coins at the Ashmolean Museum and lecturer at Oxford is a rare exception. Ancient History From Coins (176 pages, about $ 29) is a masterful summary of what numismatics contributes to our understanding of the Greek and Roman world. You will appreciate your coins more if you know the historical context that you (probably) never got in school. The book is organized in six thematic sections: “Money,” “Minting,” “Empires,” “Politics,” “Circulation,” and “Crisis.” A section of photographs illustrates 184 carefully chosen examples. “Where the heck was Sirmium?” “What is Cilicia called today?” A book of maps may seem like an odd choice, but many collectors enjoy knowing where their coins came from, and what else was going on when they were minted. 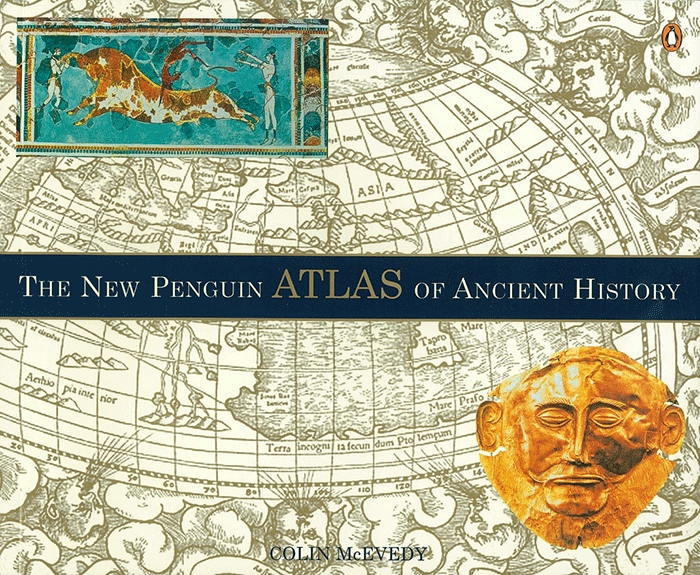 The New Penguin Atlas of Ancient History (128 pages, about $15) is a compact and inexpensive reference I use constantly. Beginning with the Neolithic Era (40,000 BCE) much of the content is pre-coinage, and the coverage ends in 362 CE, but readers will appreciate the clear layout, with text and maps on facing pages. The text is especially good on economic history and many of the maps locate trade routes, and sources of copper, gold, and silver. If money is no object, the most detailed maps of the ancient world can be found in the huge and magnificent Barrington Atlas of the Greek and Roman World ($395) treasured in the libraries of many classical numismatists. For many decades, David Sear has been the gold standard for ancient coin reference books. The one-volume 4th edition of Roman Coins and Their Values (1988) was one of the first coin books I ever bought. Beginning in 2000, Sear undertook a massive expansion of the work, brought to conclusion in 2014 with the publication of the fifth volume. Each volume of over 500 pages sells for about $60-70. A total of 21,669 different types are listed (not all illustrated, however) with estimated prices for various grades in US dollars and UK pounds. 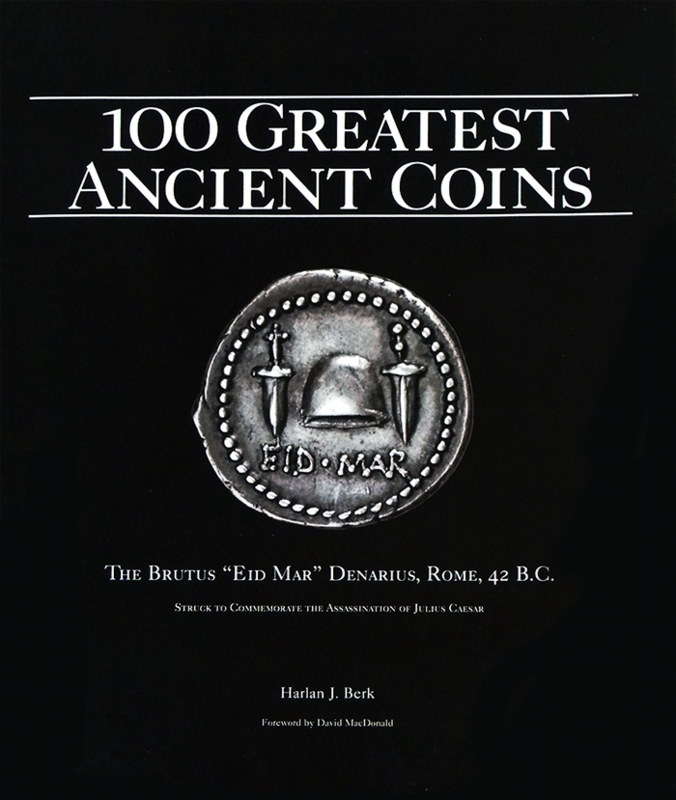 For serious collectors of Roman coins, this is the indispensable reference. For almost forty years, Greek Coins and Their Values has been a reliable companion for generations of collectors. Documenting the vast range of ancient “Greek” coinage in just two slim volumes was a daring effort, but David Sear was able to build on the previous works of G. Askew (1951) and H. A. Seaby (1959, 1966). The first volume, Europe (316 pages) covers Spain, Gaul, Britain, Central Europe, Italy, and all the historic regions and city-states of Greece. The second volume, Asia and Africa (445 pages) covers Asia Minor, Syria and Palestine, Egypt, North Africa, and the Hellenistic kingdoms. Each volume is about $50. The price data in UK pounds is long out of date, but fortunately, the respected numismatist and dealer Italo Vecchi have undertaken the massive task of revising the work, with the first volume of a new edition covering Western Europe and North Africa, expected later in 2018 at a list price of $70. “Biblical” coins have long been one of the most popular areas of classical numismatics. This includes the few specific coin types that are mentioned in the Bible, and more generally the coins that circulated in the Holy Land from the earliest times down to the second century of the Common Era. David Hendin’s Guide to Biblical Coins, now in its fifth edition, is indispensable for serious collectors of ancient Judean and related coinages. It is particularly strong on the popular coins of the Jewish War (66-73 CE) and the Bar Kochba Revolt (132 – 136 CE.) With 637 pages the book has many clear line drawings as well as a section of photographs. List price is about $85. 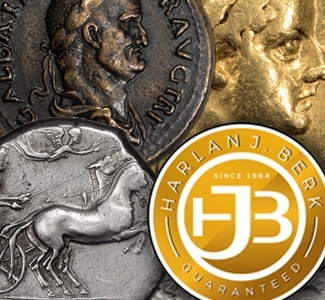 A respected numismatic scholar as well as a coin dealer, Hendin is a gifted story-teller who has published hundreds of articles on Biblical and related coins during the past four decades.